"Out with the old, in with the new" is often the sentiment that drives large-scale terminal improvement programs. Lambert-St. Louis International Airport (STL) took a different approach during the recent $70 million renovation of its mid-century Terminal 1, by working to preserve iconic architectural elements while infusing efficiency, flexibility and modern systems to carry the facility into the future. Originally built in 1956, Terminal 1 at STL was designed by famed architect Minoru Yamasaki, who also designed the original World Trade Center. When the terminal opened, it was a prime example of an operationally effective, modern facility, says Airport Director Rhonda Hamm-Niebruegge. Its copper-roofed domes were recognized around the world for decades, but time was ultimately not kind to the facility. Over the years, the terminal and concourses became cluttered as STL adapted to evolving needs, such as new security requirements. "The lobby had become sort of a hodgepodge of everything," says Hamm-Niebruegge. The facility began looking and feeling "tired," and local community members became frustrated with the lack of updates. "We had this incredible asset, but we were not competitive with the industry," she reflects. In 2007, STL officials began planning to restore the regional asset, so the airport could once again create a positive impression on arriving and departing passengers. Given the terminal's historic architectural value, preserving the look and feel of the original structure was critical, notes Hamm-Niebruegge. Bonds were sold in summer 2009 to help fund the initiative; construction began in 2010. Terminal 1 renovations cost $70 million, and the balance of the airport's $150 million Airport Experience project was spent repairing damage from a 2011 tornado and adding a new inline baggage system. Last year, STL served more than 12 million passengers, with 10 airlines and 64 nonstop destinations. Design of the comprehensive renovation was led by exp US Services. Tom Hoepf, principal design architect with the firm, notes that bringing back the clarity and beauty of the terminal's original design by simplifying and minimizing the current structure was a guiding principle throughout the project. "Yamasaki referred to the terminal as the 'Grand Central Station of the jet age,'" explains Hoepf, FAIA, LEED AP. Architects also focused on modernizing the 50-year-old facility to improve efficiency and fulfill STL's other goal of enhancing convenience and overall service for airport guests. "I think there was a sense from the community that we'd lost some of the appeal as an airport," Hamm-Niebruegge reflects. "There was just not a very good feeling about our airport and how it looked or how it was operating at the time, in terms of the customer experience." The first phase of projects began in 2008, with an overhaul of signage and wayfinding - crucial components to the customer experience, Hamm-Niebruegge notes. For years, the airport had received feedback that navigating in and around the facilities was confusing; so it worked with designers from exp and a local working group to improve the system. "Having the community weigh in on important aspects is critical," Hamm-Niebruegge emphasizes. Phase 1 also included the installation of new baggage claim carousels and restoration of the airport's iconic vaults. Over the years, the surface of the four vaulted structures had deteriorated, which complicated cleaning and maintaining them. During renovations, crews removed the existing surface and plastered the area with a crisp, white acoustical surface, explains Michelle Bear, AIA, project manager with exp. Restoring the vaults required careful coordination with STL's carriers. Airline counters were temporarily relocated as crews on scaffolding moved around the ticketing lobby, completing one section at a time. "We knew that was going to be one of the most challenging [projects], because you had to be able to get customers to the ticket counter," comments Hamm-Niebruegge. Skylights in the vaults were repaired, and crews replaced fluorescent lights with color-changing LEDs. The airport can program the new lights to display different scenes, such as seasonal holiday decorations or graphics to celebrate the success of a St. Louis sports team. Consolidating ticket offices and counters allowed the airport to open up the view to one of its courtyards - an original design feature that was lost in the cluttering that took place over the years, Hoepf notes. The layout of the revamped terminal is much more efficient and flexible, says Hamm-Niebruegge. In addition to working better for airlines and customers, it will also be easy to change as the industry evolves, she notes. New lighting and operating systems were selected to make the facility more operationally efficient. In April 2011, a tornado swept through the airport, causing nearly $35 million in damage, including damage to some of the renovation work that had already taken place. (For more details, see our July/August 2012 issue.) The tornado hit right in front of the terminal, blowing out all the historic windows in the domed area, and then traveled down the C Concourse and through the TSA checkpoint. Concourse C was closed a full year for repairs, and the overall Airport Experience program was delayed by about one year. 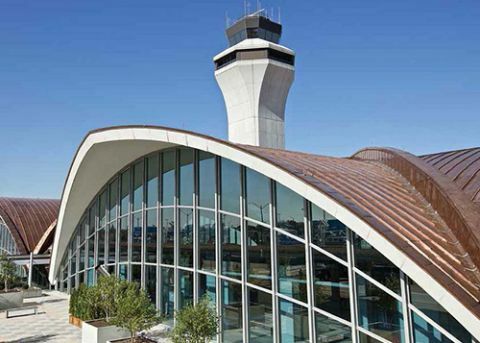 The last piece of the project was replacing the terminal's copper roof. Restoring its original brightness and beauty renewed the community's pride in the airport, notes Hamm-Niebruegge. "The copper roof was the icing on the cake," she says. "The fame and the luster the terminal brought to the city came back. For us, it was about having the community feel that we've got a gem again in our region." Although exp didn't design the original building, Hoepf says that the firm's architects feel some type of authorship of it. "We've brought it back - and improved on some things, too," he explains. He also considers STL's Airport Experience program a model for sustainability and environmental efforts, noting that officials chose to adapt and improve their existing facilities instead of throwing them away. While not part of the original Airport Experience program, an inline baggage system eventually became a key component of STL's renovations. Previously, cumbersome screening machines cluttered the lobby. "It looked awful" and didn't support the airport's vision of becoming a modern, efficient facility, says Hamm-Niebruegge. The process was also inefficient for passengers. In 2010, the airport was awarded $48 million in Homeland Security grants and funding for an inline baggage system. VTC joined the project team in 2009 to evaluate a proposal TSA had prepared for the new system. Following a "high-level review" of the concept, VTC proposed a different solution, which eventually saved the airport about $70 million compared to estimated cost projections for TSA's plan, notes VTC Project Manager J.R. Smith. VTC's plan housed the new inline system in the existing baggage space on the lower levels of terminals 1 and 2. "We were able to find room in the existing structures without having to go out and build a brand new building," Smith explains. "Even though we were working in a 50-year-old bag room, with low head clearances, we were able to [fit] all the baggage handling equipment inside and make it a lot more efficient than building new structures." Bags from all the ticket counters in both terminals travel down a conveyor system to the lower-level bag rooms, where they are screened and sorted back to their respective airlines. Each of the terminals has three Explosives Detection Systems in its baggage matrix, and a sortation system delivers the bags to the appropriate airline carousels. Moving STL's screening equipment downstairs not only simplifies the check-in process for passengers and improves the lobby's appearance, it also gives airport officials more flexibility to move or add airlines in the upstairs ticketing area. Smith notes that although VTC's design was more efficient and less costly, installing a new system in STL's 50-year-old bag room presented a few unexpected challenges. Crews found abandoned equipment, and undocumented cables and conduit needed to be identified and organized before the project could move ahead safely. In Terminal 2, a cable tray with more than 200 cables had to be relocated to fit the new baggage matrix into the available space. Because drawings weren't available, VTC hired a subcontractor to identify both ends of the cables and devised a plan to move the tray and execute a changeover. The low ceiling clearance of the space required a "very innovative" conveyor system design with ductwork relocations and smoke evacuation systems in the lower level, comments Smith. After 9/11, TSA had constructed buildings in the airport's courtyard for baggage screening and added about a dozen other screening machines throughout the terminals. The new inline system consolidated the scattered collection into a pair of three-machine matrixes. Terminal 1's inline system was completed in March 2014; Terminal 2's system went live about seven months later, in October. STL's concessions program also received a facelift during the Airport Experience. With its 20-year news and gift contract set to expire during renovations, the airport chose to solicit new bids rather than automatically extend the existing contract. The bid was won by HG-St. Louis JV, a joint venture of Hudson Group Retail, Final Phase Marketing, OHM Concession Group and Newburns Management Group. Within nine months, the joint venture remodeled and rebranded 14 retail locations at STL. Giving shops a local feel was important to the airport, and the new Discover St. Louis boutique in Terminal 2 helps achieve that objective. The store sells souvenirs from the city's various cultural institutions such as the Peabody Opera and St. Louis Art Museum, as well as mementos from local attractions including the St. Louis Zoo, Gateway Arch and Washington University of St. Louis. Merchandise supporting the city's various professional sports teams is also featured. HMS Host, STL's food and beverage concessionaire, partnered with the airport to bring in local-themed dining options. New offerings include Schlafly Beer Bar and Grill, a St. Louis-original; Eighteen 76, a Budweiser bar and restaurant; and Pasta House, which is part of a popular local chain. Hamm-Niebruegge reports a "significant uptick" in revenue per enplaned passenger since the renovation. In fact, it is double what it was five years ago. "We have more shops and restaurants than before. And if you have products people are interested in, they will spend money," she comments. "It's made a huge difference in our revenue." Adding a regional "sense of place" to the airport was also an integral part of the project. "We have such a vibrant region in terms of art, culture, botanical gardens, zoos, museums, sports teams," says Hamm-Niebruegge. "[Previously], when you landed at the airport, if you didn't know you were in St. Louis, you'd have no clue where you were. We wanted to make that feel different." Airport personnel collaborated with a newly formed arts advisory committee comprised of regional arts professionals to develop plans for where and how to display local and national works. An annual fundraiser helps offset the cost of the art program, and local organizations provide select pieces. For instance, a 6-foot-tall bronze sculpture titled China, China is currently on loan from the St. Louis Gateway Foundation. A green wall and separate vertical, cascading water feature add natural art elements to the seating area in the newly created Terminal 1 ticketing lobby. The water and live plants soften the area and help visitors connect with the space, says Hoepf. In the concourses, a series of freestanding panels feature translucent glass displays that "animate the circulation" in the gate areas, he adds. The art glass screens were the first commissioned pieces in the Lambert Art & Culture Program. "It looks like a museum in some ways," says Hoepf. The St. Louis Convention and Visitor's Bureau advertises its members (including Rams, Cardinals and Blues) on interchangeable panels throughout the terminal. A wall of windows in Terminal 1 features a revolving rotation that showcases the work of local non-profit organizations. Together, the various elements provide the "sense of place" the airport was looking for, Hoepf comments. "It's remarkable to see what was and what is now," he notes. "It's not so much that we designed a great building, but we brought a great building back to life."